Notes: Birkdale Palace was situated on the Southport & Cheshire Lines Extension Railway (SCLER) which was authorised as a route between the Cheshire Lines Committee (CLC) North Liverpool Extension Line at Aintree and Southport’s fashionable Lord Street on 11 August 1881. Although an independent concern the SCLER was backed by the CLC, a joint company made up of the Great Northern Railway (GNR), the Manchester Sheffield & Lincolnshire Railway (MS&LR) and the Midland Railway (MR). By the 1880s Southport had become a popular seaside resort and it was already served by three railways; the Lancashire & Yorkshire Railway (LYR) had lines to Manchester via Wigan and to Liverpool via Crosby and the West Lancashire Railway (WLR) had a line to Preston. Birkdale Palace station opened with the SCLER on 1 September 1884. Birkdale was a mile to the south of Southport, and on its western side it was flanked by the Irish Sea and vast expanses of sandy beaches. A station had opened at Birkdale on 24 July 1848. In 1884 having changed location twice (in November 1848 and August 1852) it was located on the Lancashire & Yorkshire Railway (LYR) Liverpool Exchange and Southport Chapel Street line in the centre of Birkdale, half-a-mile from the beach. Birkdale Palace was located on the western edge of Birkdale adjacent to the beach. A large hotel called ‘The Palace’, which overlooked the beach, had opened on in 1866, and it was from that hotel that the station received its suffix ‘Palace’. The hotel had cost of £60,000. It was luxurious with extensive grounds, magnificent reception rooms and 75 bedrooms. Over 60 staff were employed at the establishment. In the early 1880s the hotel went bankrupt, one of its difficulties being that it was not easily accessible by road or tram. It was refurbished in 1881, the grounds were reduced in size and it became a hydropathic establishment, water being pumped directly from the sea to special baths. The SCLER station was adjacent to the hotel and made it more accessible. Birkdale Palace was on the south side of Weld Road which passed over the line on a bridge. It consisted of a long wide island platform with two platform faces and was connected to Weld Road by a covered stairway. Covering approximately half of the station’s length was a canopy under which there were waiting rooms, booking facilities and toilets. Although only a mile from the SCLER terminus at Southport Lord Street, the station was well provided for as it was expected that long excursion trains would call there as it was so convenient for the beach. Goods facilities in the form of two sidings were provided on the west side of the line. To the south of the station on the south side of the Oxford Road over-bridge was Birkdale South signal box. Located on the west side of the line it was a timber-built Railway Signalling Company structure with a 13-lever frame. At the time of opening Birkdale Palace would have been served by scheduled services running to Southport Lord Street, Liverpool Central and Manchester Central. The services were operated by the CLC who had rolling stock but no locomotives of their own. Motive power was provided by the MS&LR. Excursion trains were also run in the summer months from a variety of destinations on the CLC and the networks of its owning partners. From the start the SCLER line was uncompetitive as far as Birkdale residents were concerned for journeys to Liverpool. 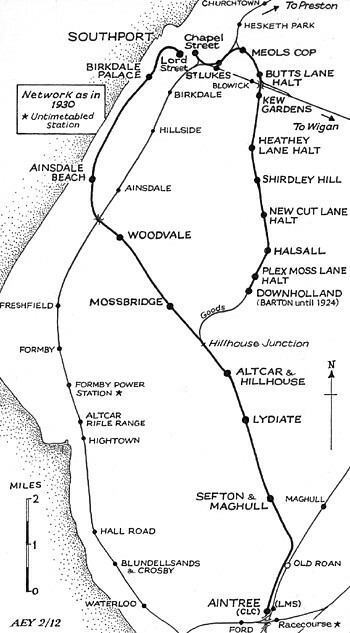 The route from Birkdale to central Liverpool using Birkdale Palace was over 30 miles. From Birkdale LYR station, which was better situated for local people, it was only 17 miles. The result was that the station was quiet in the winter months, the December 1895 timetable showing seventeen up (southbound direction) and seventeen down (Southport Lord Street direction) trains Monday-to-Friday as seen in the table below. On Saturdays there were extra trains and on Sundays three in each direction. On 1 August 1897 the MS&LR changed its name to the Great Central Railway (GCR). Birkdale Palace station closed to passengers on 1 January 1917 as a wartime economy measure ,and it did not reopen until 1 April 1919. The July 1922 timetable showed thirteen up and eleven down trains from Birkdale Palace. At the grouping of 1 January 1923 the CLC remained independent but its owning partners became the London North Eastern Railway (LNER) who held two thirds of the shares (having absorbed the GCR and GNR) and the London Midland & Scottish Railway (LMS) who held one third of the shares (having absorbed the MR). On 14 April 1927 the CLC opened a new station at Clubmoor which was built to serve new areas of housing that had been built by Liverpool Corporation. 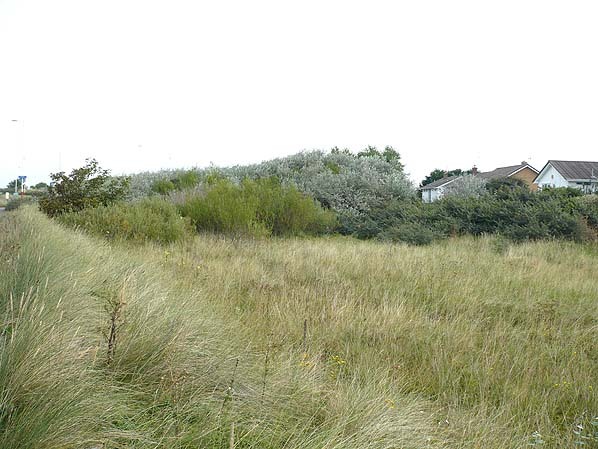 One of the primary reasons for the station was to give the residents access to the beaches of Ainsdale, Birkdale and Southport. On 1 August 1929 a station was opened at Warbreck in the Walton area of Liverpool for the same purpose. The summer 1932 timetable showed Birkdale Palace as having twelve up and eight down trains on Monday-to-Friday; on Saturdays there was an extra down service but no trains called on Sundays. During the 1930s Southport and the neighbouring beaches at Birkdale and Ainsdale were incredibly busy with day-trippers and holiday makers. The CLC promoted its route to Southport on posters encouraging visitors to use it as the preferred way to reach Southport. Although for some areas such as Warrington, Widnes, Gateacre and the eastern suburbs of Liverpool it offered a direct route to the seaside, from the large cities of both Liverpool and Manchester there were routes that were much more direct. Birkdale Palace Hotel would have provided traffic for the railway. In the 1930s it was a popular holiday and conference location with over 200 bedrooms. It was used by internationally famous film stars such as Clark Gable and Frank Sinatra, but it is not known if they arrived by train to Birkdale Palace. The outbreak of the Second World War on 3 September 1939 brought an end to holidays and day trips to the seaside. Although it remained open throughout the war Birkdale Palace station would have seen little use., except for the period 24 December 1940 to 5 July 1941. The bombing of Liverpool caused extensive damage to the former LYR line just to the north of Liverpool Exchange and the station was out of use for some weeks. Many people commuted to work in Liverpool from Southport, Birkdale and Ainsdale. So that the city could continue to function extra trains were provided on the CLC route between Liverpool Central and Southport Lord Street, and they would have served Birkdale Palace. In 1942 Birkdale Palace Hotel was taken over by the American Red Cross and used as a rest and recuperation centre for United States Army Air Force Bomber Crews. Over 15,000 crew members used the hotel between 1942 and 1945, and it is likely that many of them arrived and departed on special trains that would have run to Birkdale Palace station. On 1 January 1948 Birkdale Palace became part of British Railways (London Midland Region). The summer 1948 timetable showed four up and three down trains on Monday-to-Friday as seen in the table below; there were only three up and down services on on Saturdays. No trains called at Birkdale Palace on Sundays. Finding the ex SCLER to be unremunerative, and having an alternative route between the North Liverpool Extension Line and Southport Chapel Street via the ex LYR routes through Ormskirk and Burscough, British Railways decided to close it to passenger services, which they did with effect from 7 January 1952. All of the stations from Southport Lord Street to Sefton & Maghull were closed to passengers. 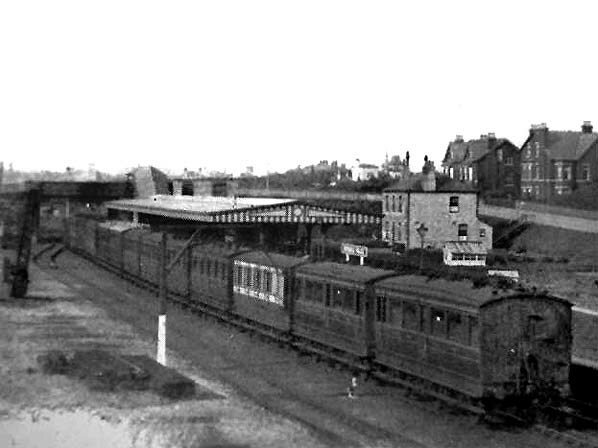 Goods facilities were retained at Birkdale Palace until 7 July 1952, after which the station closed completely along with the line between Southport Lord Street and Altcar & Hillhouse. The station buildings were demolished soon after closure but the track remained in situ until 1955. The platform survived until the late 1960s. Birkdale Palace Hotel went into liquidation in 1967. It was used as a film set in 1968 and demolished in 1969. In the late 1960s the route of the SCLER from Woodvale to Southport was converted into a highway called Coast Road, although at the site of Birkdale Palace station the road alignment runs to the west of the trackbed. In the 1970s the station site was partially developed with houses. Nothing survived of the station in August 2013. Ticket from Michael Stewart, timetable from Paul Wright and route map by Alan Young. An illustrated History of The Cheshire Lines Committee, by P Bolger, Heyday Publishing 1984. Shed Side in South Lancashire and Cheshire, by Kenn Pearce 2012. The Cheshire Lines Committee Then and Now, by Nigel Dyckhoff 1984. BR LMR Timetable Summer 1948. 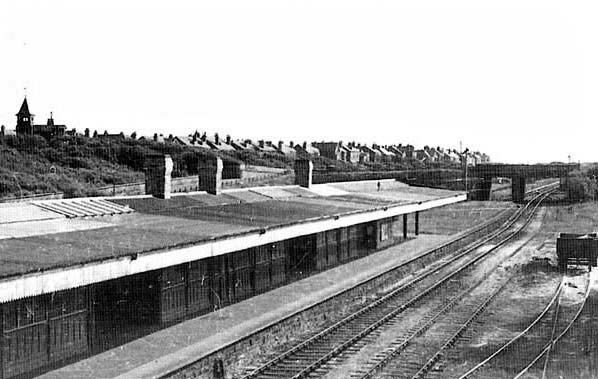 Birkdale Palace station looking north-east in the early years of the 20th Century. Birkdale Palace station shown on a six-inch scale map from 1894. Birkdale Palace station and the hotel after which it was named shown on a 1:2500 scale map from 1909. The proximity of the station to the beach is clearly illustrated. A 1960s map showing the Birkdale Palace station platform. 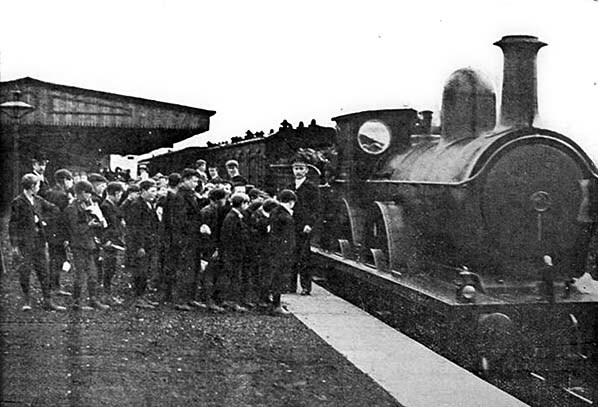 A party of boys prepare to board a train at Birkdale Palace station in the early years of the 20th century. 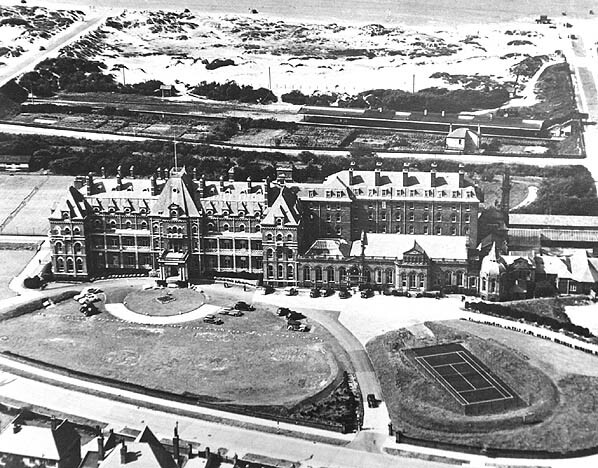 Birkdale Palace hotel and station seen from the air in the 1940s. Looking north-east at Birkdale Palace station from the Oxford Road bridge in 1949. The long wide island platform is clearly illustrated. It this time Birkdale Palace was only served by a handful of trains Monday-to-Saturday and nothing called on Sundays. To the right of the station is the station masters house. 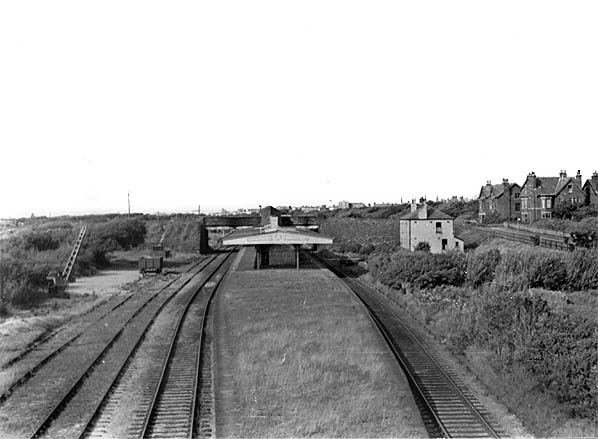 A view looking south-west at Birkdale Palace station in 1949. The view shows the sidings that were located to the west of the station. 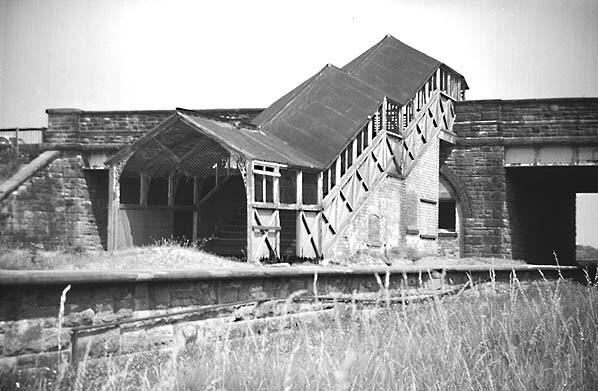 The covered steps that provided access to the island platform at Birkdale Palace station seen in the summer of 1962. The site of Birkdale Palace station looking north-east on 4 September 2013.